But the bottomline is: Discounting the price of SWA Ultimate damages the product. That’s why other networking companies have a One Price Policy, where distributors are not allowed to sell their product below the suggested retail price. Now since there is no SWA Corporation Policy (as of this writing) prohibiting the giving of price discounts, SWA members are theoretically allowed to sell SWA at any price. In theory, you can duplicate the discounted offers made by others. You are not content with working only with people who are just interested in getting a discount. 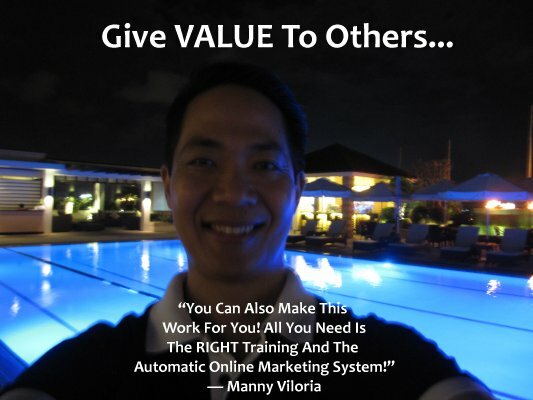 You want to work with people who are interested in getting VALUE for their money. You do not need to attract ALL customers. Go forth and attract people who value training, prioritize skills development, and believe in serving others. Join Team Manny Viloria today! Simply enter your Name and Email Address on the form on the right, and get tutorials plus tips on how to succeed online. Remember: Invest In Yourself First, Before Others Will Invest In You. When you discount the price of SWA, you are also devaluing yourself. It’s like you’re admitting that the SWA Ultimate package you are offering is not really worth the P2,500 price tag. This entry was posted in SWA Ultimate and tagged SWA Discount, SWA Promos by Manny Viloria. Bookmark the permalink.